Continuing with the Switzerland series, next stop Bern. I spent a day in the city, and managed to cover a lot of ground – the historic city centre is small, and I opted for a free walking tour of the city. 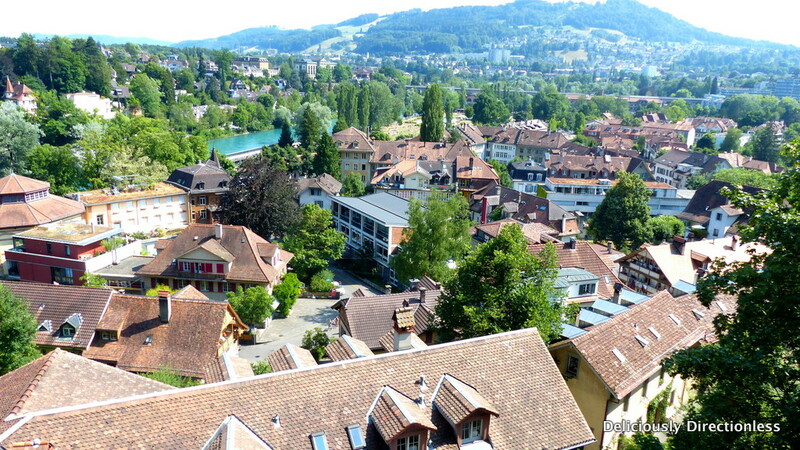 Since I was staying overnight in Bern, I left my main suitcase at the station’s left luggage facility (12 CHF!! – make sure you have exact change in coins). I had booked an Airbnb apartment in the Mattequartier (see below), which was to be available only in the evening, so I had to trudge around on the walk with a slightly heavy backpack and camera. 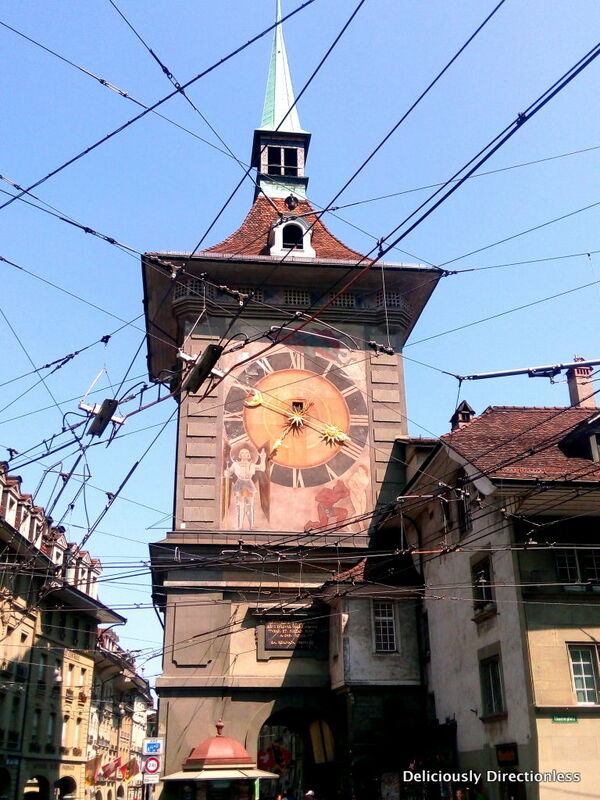 I’d highly recommend this walking tour of Bern – it’s free, just look up online and choose one of the two tours available, and show up at the meeting point. I ‘walked’ with Nora and had a great time exploring the city. 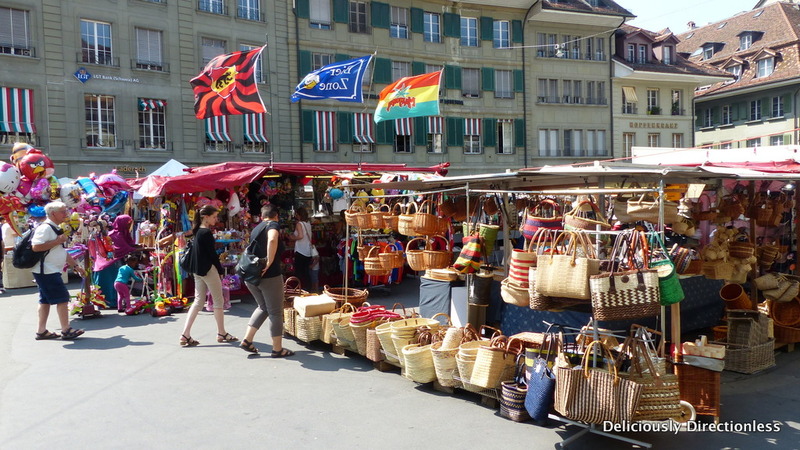 Read on to find out what to see and do in Bern, Switzerland. “What is the capital of Switzerland?” asks Nora, our guide for the day. I’m in Bern and about to embark upon a walking tour of the city, with a motley group of travellers from different countries. 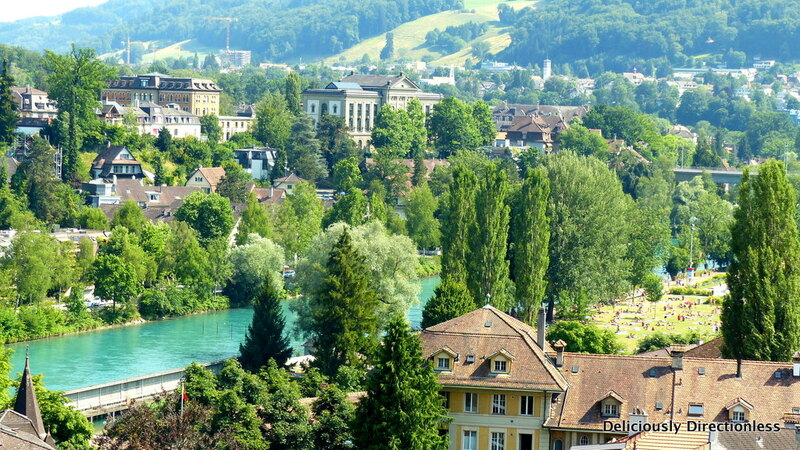 “Zurich” says a bright-eyed American, while someone else says Geneva. I mumble “Bern”, and Nora turns to me & says “Right and wrong!” Technically Switzerland has no capital, as the country is a confederation (Confoederatio Helvetica in Latin, hence the abbreviation CH) or a federal state. However, most of the government institutions (including the parliament) are located in Bern and it’s by default the de facto capital. We are standing in Bundesplatz, a large square flanked by the imposing Bundeshaus (Swiss Parliament Building) on one side. The square served as a parking lot for decades, but was later redesigned as a ‘Platz als Platz’ (the plaza as a destination), and is today the site for everything from weekly markets to cultural events, from political rallies to an ice-skating rink in winter. When it’s not being used, an attractive water display comes to life – 26 jets of water, each representing a canton of Switzerland, burst up from the ground. We watch as a group of children jump about amongst the water jets, squealing with delight, cooling off on a hot summer afternoon. 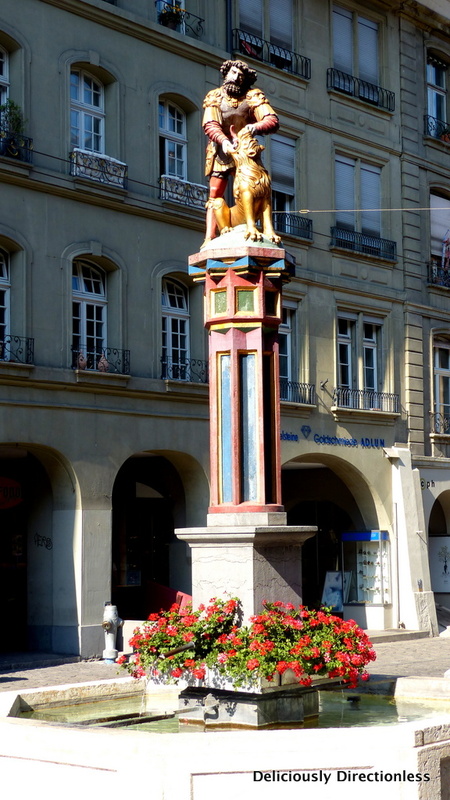 The southern side of the square is fenced in by a balustrade, which gives a sweeping view of Bern’s lower city and of the River Aare that flows through it. 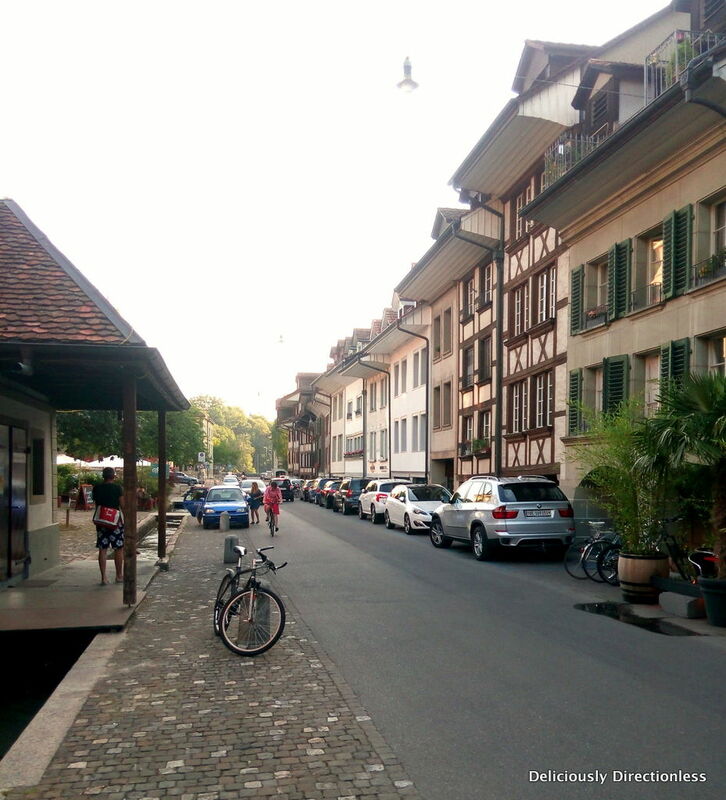 The River Aare forms a loop around the old city of Bern, perhaps the reason Berchtold V, Duke of Zähringen chose this place to found a city in 1191 – a place that would have a single point of entry and would be protected on three sides by the gushing river. According to legend, the Duke decided to name his city after the first animal he would hunt in the neighbouring woods. This turned out to be a bear, bär / bären (pl) in German, and hence the name Bern. A black bear with a red tongue and claws adorns the coat of arms of the city, and is an emblem of the city as well as the Bern canton. A steep walkway descends from the parliament building towards the lower city and the river, and we follow the Aare as it flows with great force towards one of the many bridges spanning the river. 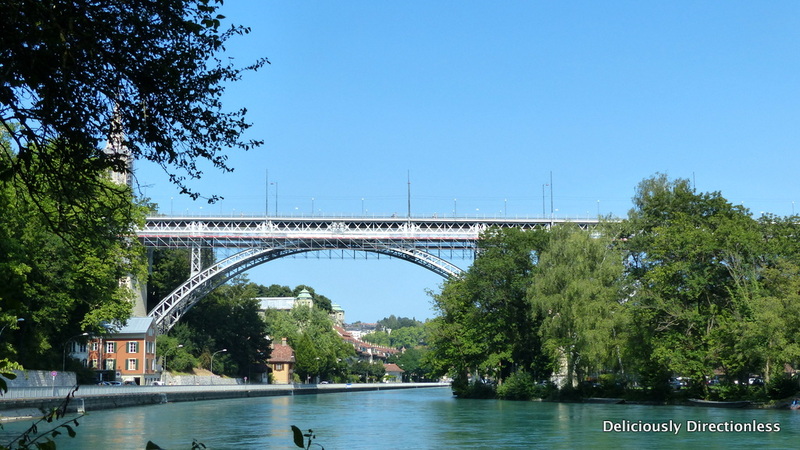 This particular bridge, Kirchenfeldbrücke, is the first high-level bridge over the Aare, and was quite notorious as a suicide spot, until the city authorities put up a metal netting on either side. We meander along in the sweltering summer heat, this year (2015 summer) being particularly brutal because of the heat wave that has savaged large parts of Europe. 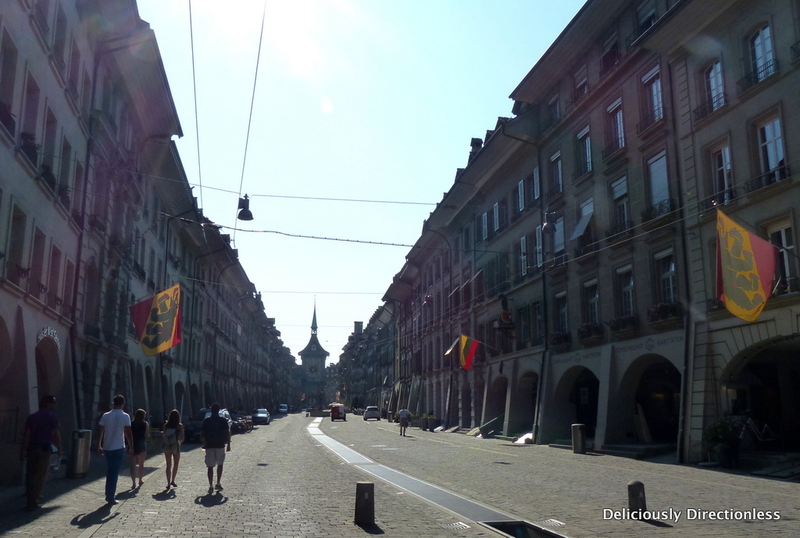 We arrive in the Mattequartier (Matte district), the erstwhile working class neighbourhood of old Bern. At one point it was known for its brothels, and even Casanova supposedly had a few dalliances here! The demographics of the district gave rise to Mattenenglisch (Matte English), a sort of Pig Latin with complex rules of substituting the first vowel and moving around consonants. 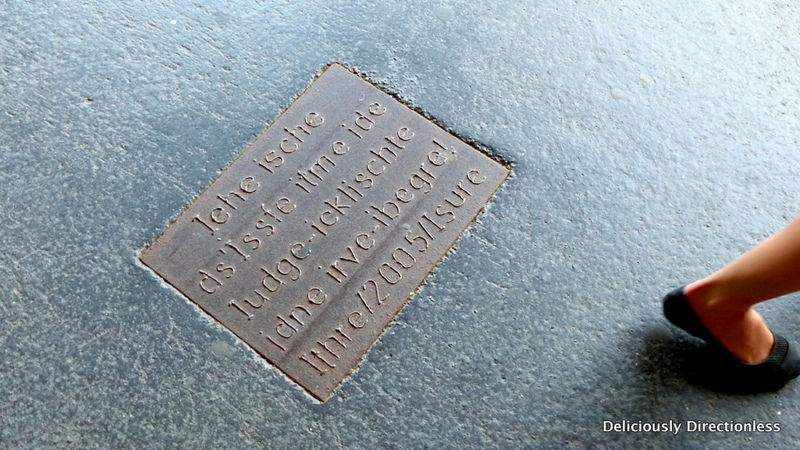 This language evolved so that the Matte people could communicate in a way that the police, and the rest of the Bernese, couldn’t understand what they were saying. Matte English was prevalent right up to the middle of the 20th century, but has since fallen out of use as the social fabric of the district has changed since then. A series of stone or wooden staircases connect the Matte with the upper areas of Bern, and we huff and puff over a rather steep one to arrive at the Münsterplattform (Minster Terrace), once the cathedral cemetery and now a lovely park adjoining the Berner Münster (Bern Minster or Cathedral). 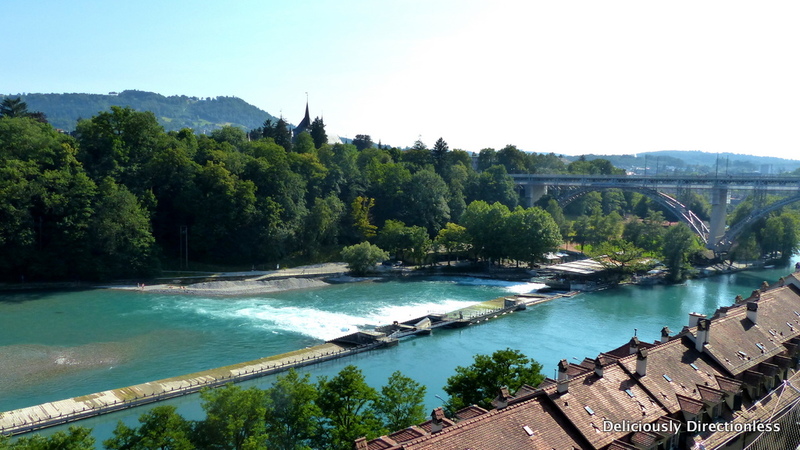 We stop to catch our breaths and admire the view of the Matte and the Aare from the terrace. 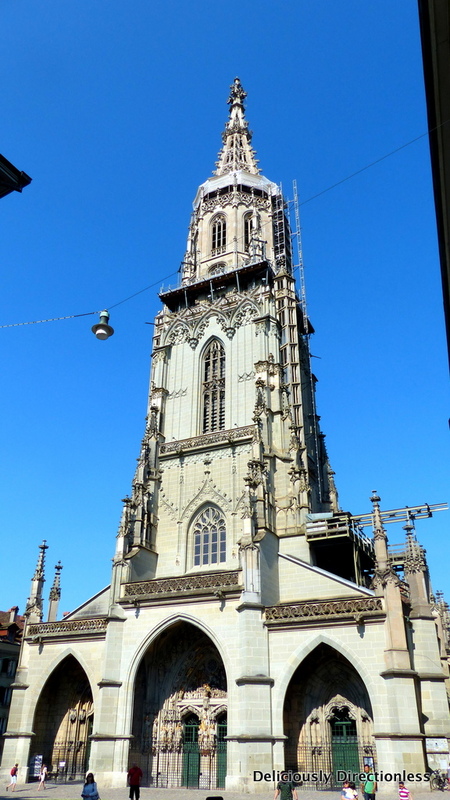 We then proceed to the cathedral, built in Gothic style and described by several superlatives – the tallest cathedral in Switzerland, the tallest bell tower and of course, the largest bell in the country. For a small fee you can ascend the 344 steps to the top of the spire for a stunning view, all the way up to the Bernese Alps. However, we had had quite enough of steps for the day, and decided to pay our respects at the cathedral and move further into the Old City. 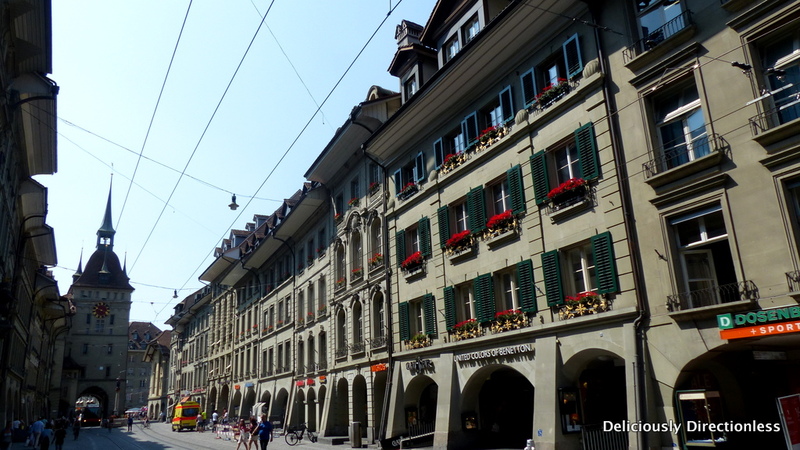 The Old City of Bern is a UNESCO Cultural World Heritage Site and most of its layout and architecture has remained virtually unchanged since medieval times. We are on Kramgasse and on either side of the street are arcade passages – the lauben, which house rows upon rows of shops. 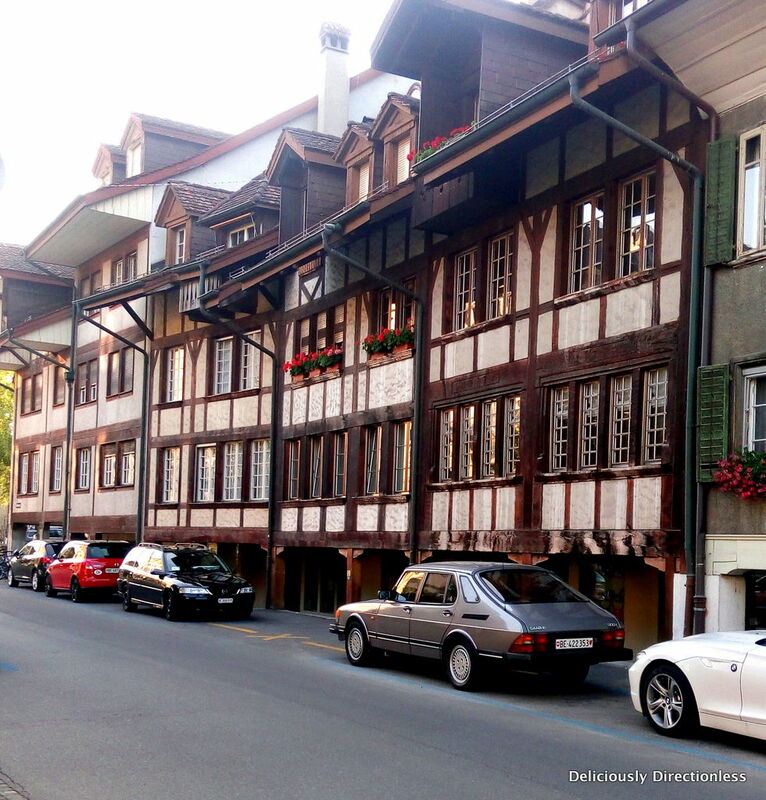 In 1405 large parts of Bern, and mostly its wooden buildings in the old city, were destroyed in a fire. The city was rebuilt in sandstone and the arcades were added to create a long, covered walkway. Each of the buildings also had a vaulted cellar, which today house trendy bars, shops and theatres. 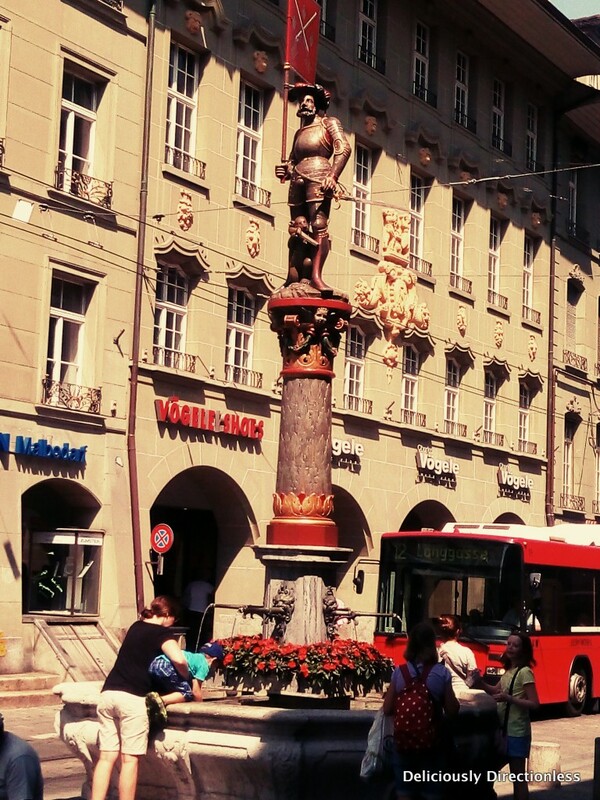 Every few minutes, fire-engine-red trams run along the street and we have to be careful crossing over to the middle to admire one of many fountains in Bern. The ‘City of Fountains’ is home to more than 100 public water fountains, which were added in the 16th century to show off the power and wealth of the city, and of course to provide fresh drinking water to the citizens. The fountains still perform the latter function and we had been partaking of them all throughout the tour, to keep hydrated and to try and beat the relentless heat. 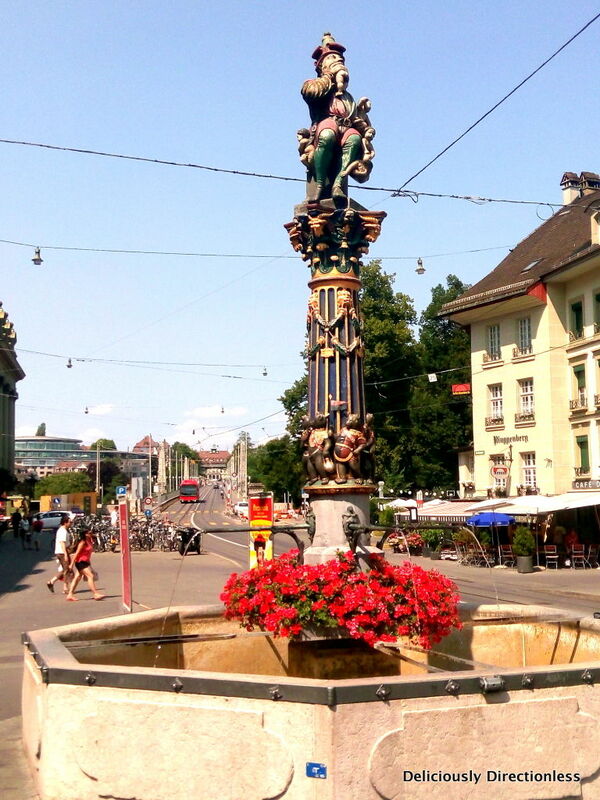 Many of the fountains were topped with colourful allegorical figures and eleven of these fountains still stand today – ostensibly preaching social and moral lessons. 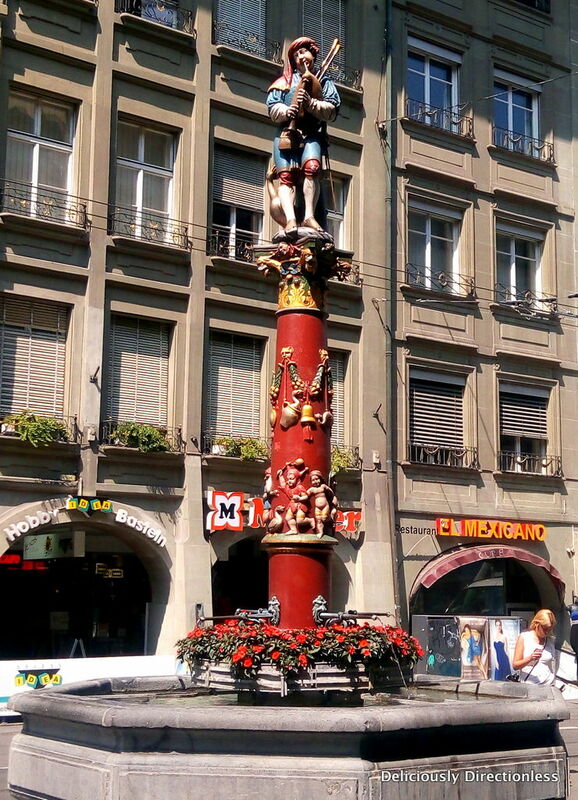 The Kindlifresserbrunnen (Ogre Fountain) on Kornhausplatz shows a grotesque ogre gobbling children – Bernese parents have long used this fountain as a threat to discipline their misbehaving children! 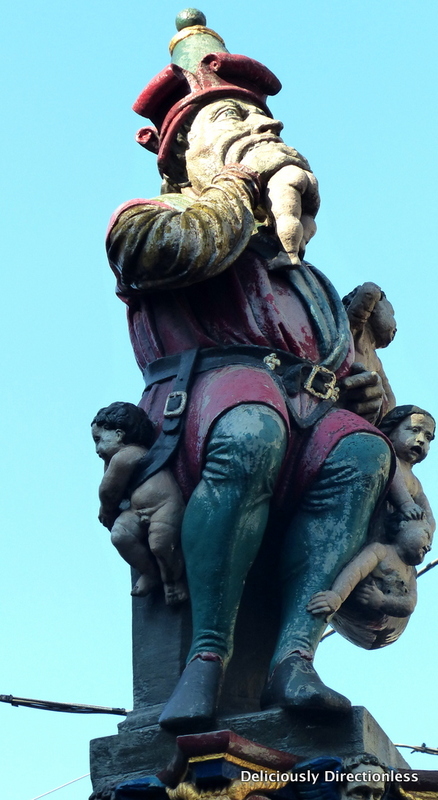 The Pfeiferbrunnen or the Bagpiper Fountain depicts a barefoot bagpiper, apparently suggesting his exclusion from society. 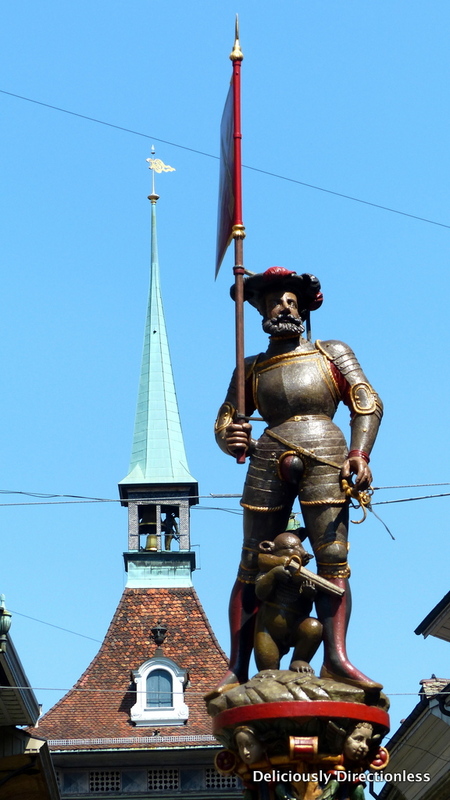 There’s the Simsonbrunnen on Kramgasse, showing the biblical story of Samson slaying a lion with his bare hands, and the Schützenbrunnen or the Musketeer fountain on Marktgasse in front of the Zytglogge (Clock Tower). We pause at no. 49 on Kramgasse where Albert Einstein rented a second-floor flat from 1903 and 1905. This was an especially productive period for the great scientist, and it was in 1905 (his annus mirabilis) that he came up with the Special Theory of Relativity. The house is sort of a museum to Einstein today, and is restored to reflect the style of the period when he lived here. At the end of Kramgasse, as we move inwards into the old city, stands the landmark medieval Clock Tower, which was the first western city gate when it was built in the early 13th century. 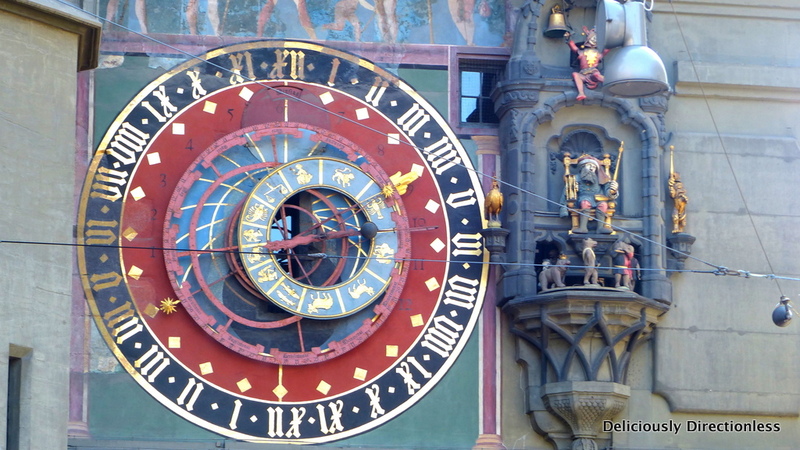 At various times in history, it served as a guard tower and a prison, and then in the 15th century a massive, ornate astronomical clock was built on it. It’s nearing 5 p.m. and we assemble in front of the clock tower to watch the hourly display of mechanical figures – a crowing roosting, a lion, parading bears, a knight, a piper, a dancing jester and a bearded Chronos, no to mention the gilded jacquemart or bell-striker who uses a hammer to ring out the great bell and mark the hour. After the little performance we follow Nora under the tower’s arch where she points out to a series of metal rods mounted on the wall. “In the olden days, these were standard units of length, such as cubit and fathom, which people could use to make sure that they were not getting cheated in the cloth market that was held nearby”, elaborates Nora. 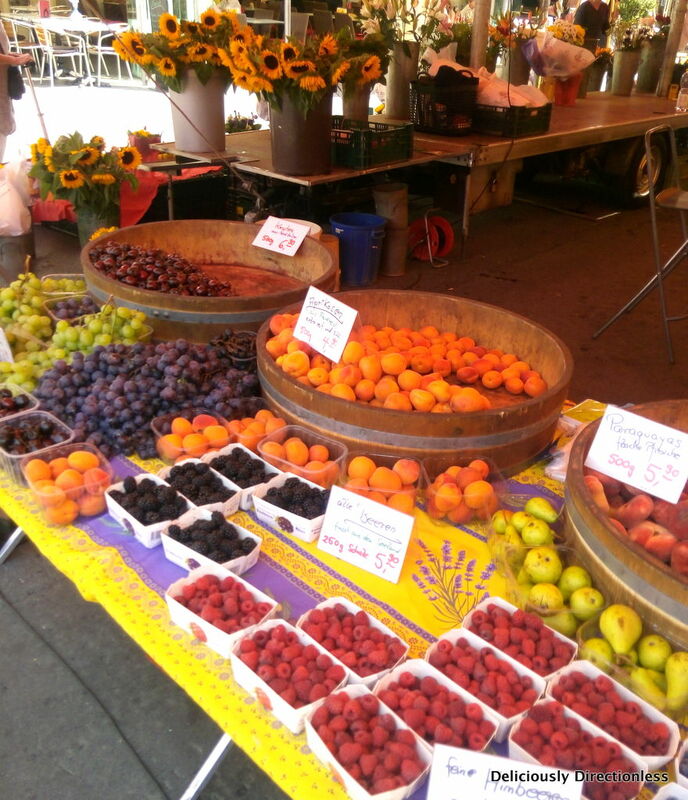 After the tour, I head further down Marktgasse, just beyond the Käfigturm (Prison Tower, and the second city gate) and to Bärenplatz where a fruit, vegetable and flower market is held ever day between April & October, and later in December. I wander around feasting my eyes on colourful bunches of lilies, roses and sunflowers, and on big wooden tubs full of summer fruits. I buy some sun-warmed apricots and nectarines to savour as I make my way back to my AirBnB apartment in the Matte – no longer a working class neighbourhood (or a red light district), instead now filled with young families, couples and students, giving the area a youthful buzz. 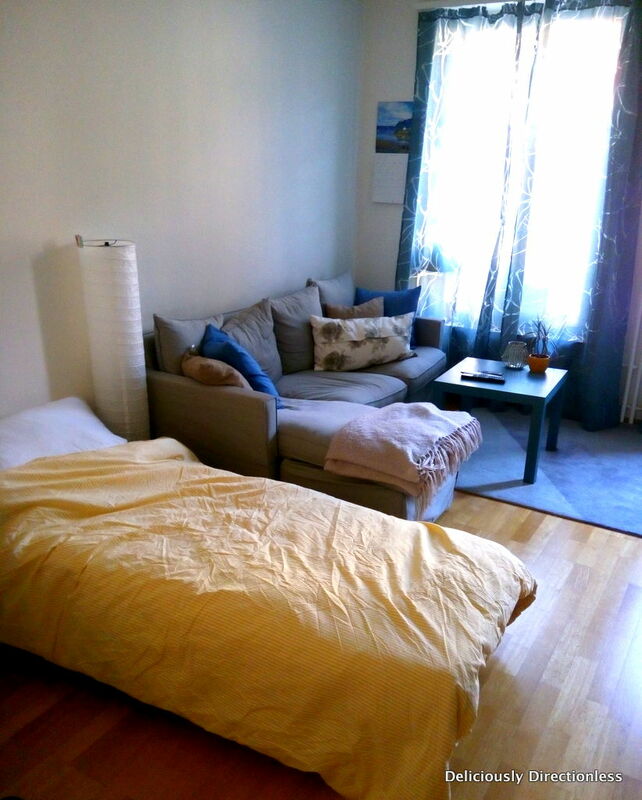 I stayed overnight in the living room of my Airbnb hostess Alexandra’s flat in Mattequartier. It’s easy to get to and from the Matte district to the city centre. Take a tram from Nydegg stop and you will be in the city centre in 10 minutes, and at the train station in 15. There are couple of nice cafes and restaurants near the flat. 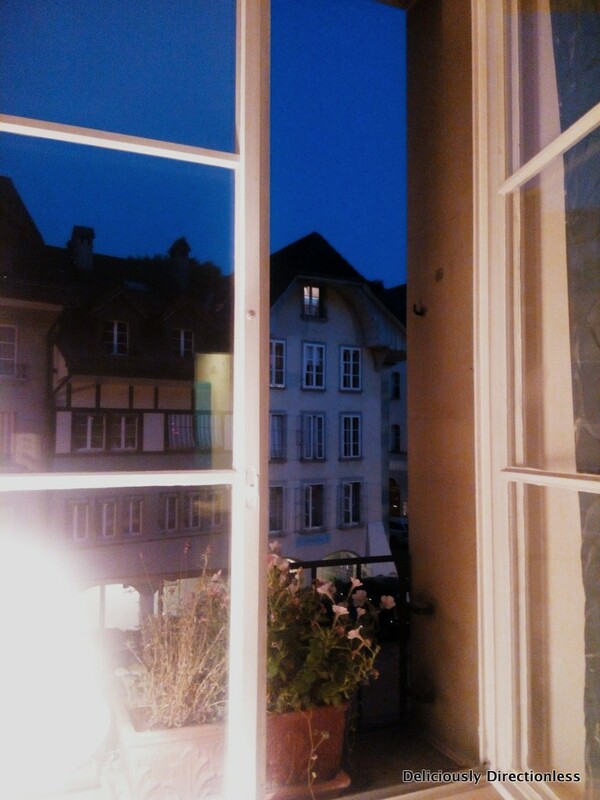 I had dinner at Fischerstübli – excellent fish dishes and some nice desserts. 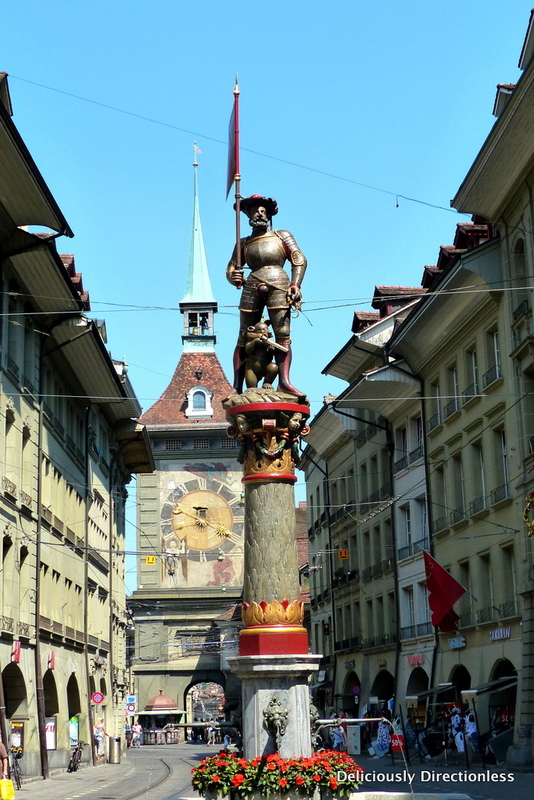 Free Walking Tours Bern offer a choice of 2 walks, which are conducted by a local and are free (tips are welcome). More details here. This article was commissioned by Deccan Herald‘s Sunday Herald travel section. An edited version of this was published in the edition dated October 18, 2015. Read here. Well, this means I really need to check out Switzerland and Bern looks beautiful! But I have to say, I didn't envy you with all of those extremely difficult looking Swiss-German words you had in this post. I would have messed that up for sure ;-).